Preview: The South Florida Bulls have tailed off as a program through recent seasons and the Bulls are coming off just a 4 win year. Even getting to 4 wins in 2014 was a bit misleading considering the wins for USF came against the likes of SMU, Tulsa, and UConn who were some of the worst teams in the FBS along with an FCS win over Western Carolina. It hasn’t been a successful transition into the AAC for head coach Willie Taggart who’s led the program to just a 6-18 record through his first 2 seasons as the head man. 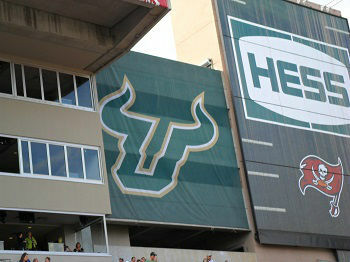 USF will have new coordinators on both sides of the ball and this could be a make or break year for Taggart. South Florida had little to no success under Taggart’s run heavy offense over the past two seasons and as a result the team is switching over to an up-tempo system. The first order of business is to find the QB of the future to run this system. It looks like the favorite to win the job will be underclassman Quinton Flower, but the veteran Steven Bench could also figure in to the battle. Whoever wins the job will work behind an O-line that’s in rebuild mode with just 2 starters back. The strength of the offense looks to come from returning starting RB Marlon Mack who rushed for over 1,000 yards last season. The receiving corps returns just 1 starter and this unit looks to build around Rodney Adams and Ryeshene Bronson. The defense was hot and cold last season, but the group was better than the numbers would indicate given they had to work behind a terrible offensive unit. Even with some moderate success the defense will transition into the 4-2-5 scheme under new DC Tom Allen who comes over from Ole Miss. The defense returns 7 starters, but the D-line has the most room to fill with just 1 returning starter back in the fold. This unit will build around veteran end Eric Lee. The line backing corps returns 3 starters, but there’s only 2 spots available in the new scheme. LB will be a position of depth and strength. The secondary also has talent to work around with 3 returning starters and this group will build around Byrd, Fullwood, and Abraham. Prediction: There has to be signs of improvement this season or Taggart could be let go after his third season as the head man. Taggart showed some Taggart at least showed some flexibility with the switch to an up-tempo attack on the offensive side of the ball. The offense has a great piece to build around with Mack back in the fold and the back end of the defense should be steady. A tougher schedule likely makes it tough for the Bulls to even reach the 4 wins they had a season ago.